WE have in the last exposition endeavoured to explain the origin of the rite of Confirmation and to connect its development in the second century with the first notice of its rise in germ and principle at Samaria. There have been from time to time modifications and changes in the ordinance. The Church has availed itself of the power she necessarily possesses to insist upon different aspects of Confirmation at different periods. The Church of England at the Reformation brought out into prominence the human side. of Confirmation as we may call it, which views the rite as a renewal and strengthening of the baptismal vows of renunciation, faith, and obedience, which had fallen too much out of sight, while still insisting on the Divine side as well, which regards Confirmation as a method of Divine action, a channel of Divine grace, strengthening and blessing the soul. Yet no one can imagine that the Reformers invented a new ordinance because they insisted on a forgotten and latent side of the old rite. So it was during the second century and in Tertullian’s time. The exigencies of the Christian Church of that age had led to certain modifications of apostolic customs, but the central idea of solemn imposition of hands continued, and was regarded as of apostolic appointment. If we descend a little lower this is plain enough. St. Cyprian, the contemporary and disciple of Tertullian, expressly attributes the institution of the rite to the action of the Apostles at Samaria, a view which is subsequently attested by those great lights of the ancient Church, St. Jerome and St. Augustine.156 As my object is, however, not to write a treatise on Confirmation, but to trace the evolution and development of apostolic customs and ritual, and to show how they were connected with the Church of the second century, I restrain myself to Tertullian alone. I cannot see how this argument is to be evaded without rejecting the testimony of Tertullian and denying what we may call the historic memory and continuity of the Church at the close of the second century. Upon the testimony of Tertullian we very largely depend for our proof of the canonicity of the books of the New Testament. Men when impugning or rejecting Tertullian’s witness on this or any similar question, should bear in mind what the results of their teaching may be; for surely if Tertullian’s clear evidence avails not to prove the apostolic character of confirmation, it cannot be of much use to establish the still more important question of the canon of the New Testament or the authorship of the Gospels and Acts. We think, on the other hand, that Tertullian’s references to this practice are naturally and easily explained by our theory that the Churches established by the Apostles followed their example. The first converts that were made after the Apostles had founded a Church were treated by the resident bishop and presbyters exactly as the Apostle had treated themselves. Timothy at Ephesus acted as he had seen St. Paul do. Timothy completed his converts’ baptism by the imposition of hands, and then his successor followed the example of Timothy, and so confirmation received that universal acceptation which the writings of the Fathers disclose. I Let us now return to the consideration of the actual doings of Peter and John at Samaria, and the lessons we may draw from thence as touching the manner in which men should follow the example left by them at this crisis in Church history. The Apostles prayed for those that had been baptised into the name of the Lord Jesus, and then they laid their hands upon them, and the baptised received the Holy Ghost. Prayer went before the imposition of hands, to shove that there was nothing mechanical in their proceedings; that it was not by their own power or virtue that any blessing was granted, but that they were only instruments by whom the Lord worked. The Apostles always acted, taught, ordained, confirmed, in the profoundest confidence, the surest, faith that God worked in them and through them. St. Paul in his address to the elders of Miletus and Ephesus, whom he had himself ordained, spoke of their ordination, not as the work of man, but of the Holy Ghost. He pierced the veil of sense and saw, far away and behind the human instrument, the power of the Divine Agent who was the real Ordainer. "Take heed unto yourselves and to all the flock, in the Which the Holy. Ghost hath made you bishops." And so again in his words to Timothy there was not a shadow of doubt when he bid him "stir up the gift of God, which is in thee through the laying on of hands": a gift which was doubtless no miraculous power, but the purely, spiritual endowment, needful now as in ancient times, for the edification and strengthening of human souls. As it was in ancient times so is it still; the Church of Christ unites prayer with imposition of hands. She cannot recognise any difference in the methods of God’s dealing with human souls in apostolic times and in modern ages. Human wants are the same, human nature is the same, the promises of God and the ministry of God are the same; and therefore as in Samaria, so in England, the work of baptism is completed when further prayer is offered, and the imposition of hands by the chief ministers of God’s Church signifies her holy confidence in the abiding presence and work of the Divine Spirit. We desire to insist upon this devotional side of confirmation, because the rite of confirmation has been too often treated as a mere mechanical function, just indeed as men in times of spiritual deadness and torpor come to regard all spiritual functions in a purely mechanical aspect. The New Testament brought to light a religion of the spirit; but human nature ever tends to become formal in its religion, and therefore has persistently striven, and still persistently strives, to turn every external function and office in a mechanical direction. The Apostles prayed and then laid their hands upon the Samaritan converts, and we may be sure that these prayers were intense personal supplications, dealing directly with the hearts and consciences of the individuals. Confirmation, united with fervent prayer, public and private, with searching addresses directed to the conscience, with personal dealing as regards individual hearts, followed by public imposition of hands, -surely every one must acknowledge that such a solemnisation and sanctification of the great crisis when boyhood and girlhood pass into manhood and womanhood must have very blessed effects. Experience has, indeed, proved the wisdom of the ancient Church concerning this ordinance. Confirmation has not developed itself exactly in the East as we know it in the West. In the Eastern Church, as amongst the Lutherans of Germany, confirmation can be administered by a presbyter as well as by a bishop, to whom alone the Western Church limits the function. But whether in the East or West, confirmation is regarded as the transition step connecting baptism and the Eucharist. Christian bodies which have rejected the ancient customs have felt themselves obliged to adopt a similar method. Preparation for first Communion has taken the place of confirmation. There has been the same earnest dealing with conscience, the same fuller instruction in Christian truth and life, and the one thing lacking has been that following of the apostolic example in solemn imposition of hands, which would have thrown back the young mind to the days of the Church’s earliest life, and helped it to realise something of the continuity of the Church’s work and existence. Many, as I know, ministering in societies where confirmation after the ancient model has been rejected, have bitterly lamented its disuse as depriving them of a solemn appointed time when they should have been brought into closer contact with the lives, the feelings, and the consciences of the lambs of Christ’s flock. I am bound to confess, at the same time, that no one is more alive than I am to the many defects and shortcomings in the modes and fashions in which confirmation is sometimes viewed and conferred. The mere mechanical view of it is far too prevalent. Careful and prayerful preparation, systematic instruction in the field of Christian doctrine, is still in many cases far too little thought of. Confirmation offers a splendid opportunity when an earnest pastor may open out to young minds eager to receive truth, a fuller acquaintance with the deep things of God. Alas! how miserably such earnest young minds are sometimes met. It is stated that it was by injudicious treatment at such a time that the ardent, enthusiastic mind of the late Charles Bradlaugh was alienated from Christian truth. Intelligent sympathy is what the young desire and crave for at such seasons. Then it is that the man who has kept his mind fresh and active by wide and generous study finds the due reward of his labours. He does not attempt to meet doubts and difficulties by foolish denunciations. He knows that such doubts are in the air; that they meet’ the young in the newspapers, magazines, conversations of the day. He proves by his instructions that he knows of them and enters into them. He encourages frank discussion of them, and thus often proves himself at a very trying time the most helpful and consoling friend to the young and troubled spirit. Confirmation, if viewed merely from the purely human side, and if we say nothing at all about a Divine blessing, offers a magnificent opportunity for a wise pastor of souls. He will, indeed, treat different ranks in different ways. A class of ploughboys or of village lads and girls need plain speaking on the great facts of life and of the Gospel, while the higher and more educated or sharper inhabitants of cities and towns require teaching which will embrace the problems of modern thought, as well as the foundation truths of morals. A perfunctory repetition of the Church Catechism, as in some parishes, or a brief study of a portion of the Greek Testament, as in some of our public schools, is a miserable substitute for that careful preparation, embracing devotional as well as intellectual preparation, which such an important function demands.157 Then, again, the method in which confirmation is administered calls for improvement and change. The confirmation of immense crowds at central churches tends to confirm the mere mechanical idea about confirmation. Parochial confirmations, a confirmation of the young of each congregation in presence of the congregation itself, that is the standard at which we should aim. The Church of Rome can give us wise suggestions on this point. Some time ago I noticed an account of a Roman Catholic confirmation in the west of Ireland. It was held in a town of twelve or fifteen thousand inhabitants. The bishop took a week for the confirmations in that town, examining all the children beforehand, bringing them thus into direct contact with himself as their supreme pastor, and assuring himself of the sufficiency of their preparation. II We have now noted some of the defects connected with modern confirmations; but the conduct of Simon Magus and this incident at Samaria remind us that defects and shortcomings must ever exist, as they existed in the Church of the Apostles. We note here Simon’s offer and St. Peter’s address, Simon Magus had believed, had been baptised, and doubtless had also been confirmed by the Apostles. In the case of some of the Samaritans, at least, the presence of the Holy Ghost must have been proved by visible or audible signs, for we are told that when Simon saw that through the imposition of apostolic hands the Holy Ghost was given, he offered them money to enable him to do the same. His offer sufficiently explains the nature of his faith. He was convinced intellectually of the truth of certain external facts which he had seen. He knew nothing of spiritual want, or the power of sin, or a desire for interior peace and sanctity. He looked upon the Apostles as cleverer jugglers and sorcerers than himself, accessible to precisely the same motives, and therefore he offered them money if they would endow him with the knowledge and power they possessed and exercised. 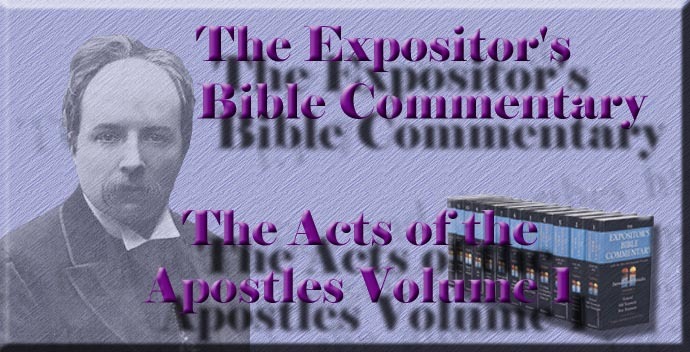 The Acts of the Apostles, as a mirror of all Church history, thus selects for our instruction an event which sounds a warning needful for every age. Simon Magus had a mere intellectual knowledge of the truth, and that mere intellectual knowledge, apart from a moral and spiritual conception of it, plunged him into a deeper fall than otherwise might have been the case. Simon Magus was a typical example of this, and successive centuries have offered many notable imitations. Julian the Apostate was brought up as a Christian clergyman, and used to read the lessons in Church, whence he would adjourn to join in the polluting rites of paganism; and so it has been from age to age, till in our own time some of the bitterest opponents of Christianity, at home or in the mission field, have been those who, like Simon, knew of the Gospel facts, but had tasted nothing of the Gospel life. We may derive from this incident guidance in a difficult controversy which has of late made much stir. Men have asserted that Christian missionaries were giving far too much time to mere intellectual training of pagans, instead of devoting themselves to evangelistic work. A writer who has never visited the mission-field has no right to pass judgment on such a matter. But cannot we read in this passage a warning against such a tendency? Intellectual conviction does not mean spiritual conversion. Of course we know that no human effort can ensure spiritual blessings, but if intellectual training of clever pagan youths, and not spiritual work, be regarded as the great object of Christian missions; if the Holy Ghost be not honoured by being made the supreme lord of heart and life and work, we cannot expect any blessed results to follow. We read very little in the earliest ages of the Church about educational missions. The work of education was not despised. The school of Alexandria from the earliest times held high the standard of Christian scholarship. But that school, though open, like all ancient academies, to every class, was primarily intended for the training of Christian youth, placing before all other studies the Divine science of theology. The offer, again, of Simon Magus, has given a name to a sin which has been found prevalent in every age and in every country. The sin has, indeed, taken different shapes. Simony, throughout the Middle Ages, was a common vice against which some of the more devout Popes strove long and vigorously. In England and according to English law simony means still the purchase of spiritual office or spiritual functions. It would be simoniacal for a bishop to receive money for conferring holy orders or for appointment to a living. It would be an act of simony for a man to offer or give money to attain either holy orders or a living. How then, it may be said, does the unhallowed traffic in Church livings continue to flourish? Simply because, through colourable evasions, men bring themselves to break the spirit of the law while they keep within its strict letter. Simony, how ever, is a much more extensive and far-reaching corruption than the purchase of ecclesiastical benefices. Simony can take subtler shapes and can adapt itself to conditions very different from those which prevail under an established Church. Every one recognises, in word at least, the scandalous character of money traffic in Church offices. Even those who really practise it, hide from themselves, by some device or excuse, the character of their action. But the simoniacal spirit, the essence of Simon’s sin, is found in many quarters which are never suspected. What is that essence? Simon desired to obtain spiritual power and office, not in the Divine method, but in low earthly ways. Money was his way because it was the one thing he valued and had to offer; but surely there are many other ways in which men may unlawfully seek for spiritual office and influence in the Church of Christ. Many a man who would never dream of offering money in order to obtain a high place in the Church, or would have been horrified at the very suggestion, has yet resorted to other methods just as effective and just as wrong. Men have sought high position by political methods. They have given their support to a political party, and have sold their talents to uphold a cause, hoping thereby to gain their ends. They may not have given gold which comes from the mine to gain spiritual position, but they have all the same given a mere human consideration, and sought by its help to obtain spiritual power; or they preach and speak and vote in Church synods and assemblies with an eye to elections to high place and dignity. An established Church, with its legally secured properties and prizes, may open a way for the exercise of simony in its grosser forms. But a free Church, with its popular assemblies, opens the way for a subtler temptation, leading men to shape their actions, to suppress their convictions, to order their votes and speeches, not as their secret conscience would direct them, but as human nature and earthly considerations would tell them was best for their future prospects. How many a speech is spoken, how many a sermon is preached, how many a vote is given, not as the Holy Ghost directs, but under the influence of that unhallowed spirit of sheer worldliness which led Simon to offer money that he too might be enabled to exercise the power which the unworldly Apostles possessed. The spirit of simony may just as really lead a man to give a vote or to abstain from voting, to make a speech or keep silence, as it led men in a coarser and plainer age to give bribes for the attainment of precisely the same ends. In this respect, again, as warning against the intrusion of low earthly motives in the concerns of the Divine society, the Acts of the Apostles proves itself a mirror of universal Church history. Then we have the address of St. Peter to this notorious sinner. It is very plain-spoken. The Apostle had been himself a great sinner, but he had not been harshly or roughly dealt with, because he had become a great penitent. St. Peter was most sympathetic, and could never have spoken so sharply as he did to Simon Magus had he not perceived with quick spiritual insight the inborn baseness and hollowness of the man’s character. Still he does not cut him off from hope. He speaks plainly, as Christ’s ministers should ever do when occasion requires, Simon Magus was a man of great influence in Samaria, but there was no "fear of man which bringeth a snare" about the Apostles, and so St. Peter fearlessly tells Simon his true position. "He was in the gall of bitterness and bond of iniquity." He indicates to him, however, the steps which, whether then or now, a person in that position should take if he desires to escape from the due reward of his deeds. "Repent therefore of this thy wickedness." Repentance, then, is the first step which a man whose heart is not right in God’s sight has to take. There was no hesitation, as we have already remarked when speaking of St. Peter’s preaching at Jerusalem, about pressing upon men the duty of hearty, sincere repentance, embracing sorrow for sin and genuine amendment of life. Then having exhorted to repentance, the Apostle proceeds, "And pray the Lord, if perhaps the thought of thy heart shall be forgiven thee." Prayer is the next step. First comes repentance, then prayer, and then forgiveness. There was nothing in St. Peter’s teaching which lends the least countenance to the modern error which teaches that an unconverted man should not pray, that his one duty is to believe, and, till he does so, that his prayer is unacceptable to God. Simon Magus was as estranged from God as a human soul could well have been, yet St. Peter’s word to him then, and his word to every sinner still, would be an exhortation to diligent prayer. "Pray God if perhaps the thought of thine heart shall be forgiven thee." The exhortation of Peter was blessed, for the time, to the sinner. It awoke a temporary sense of sin, though it wrought no permanent change. It has left, however, an eternal blessing and a permanent direction to the Church of Christ. In his preaching on the day of Pentecost to the Jews of Jerusalem, he shows us how to deal with those who are not as yet partakers of the Christian covenant. "Repent ye, and be baptised every one of you in the name of Jesus Christ," was his message to the devout Jews of Jerusalem; "Repent and pray" is his message to the sinner who has been brought, all unworthy, into the kingdom of light and grace, but knows nothing of it in heart and life. St. Peter valued the blessings of belief in Christ and admission by baptism into His kingdom, but he knew that these benefits only intensified a man’s condemnation, if not realised in heart and lived in practice. St. Peter’s visit to Samaria in company with St. John has much to teach the Church on many other points, as we have pointed out, but no lesson which can be derived from it is so important as that which declares the true road for the returning sinner to follow, the value of repentance, the efficacy of heartfelt prayer, the supreme importance of a heart right in the sight of God. The evidence from these writers will be found in a collected shape in Bingham's Antiquities , book xii., chap. iii., sec. vi. St. Augustine, in his Tract VI., on 1 St. John iii., expressly deals with the objection that because the Apostles imparted miraculous gifts by the imposition of hands, therefore their conduct forms no precedent for us. "In the first age the Holy Ghost fell on them that believed; and they spake with tongues which they had never learned, as the Spirit gave them utterance. These were signs proper for that time; for then it was necessary that the Holy Ghost should be thus demonstrated in all kinds of tongues, because the gospel was to run throughout the whole world in all sorts of languages. But this demonstration once made, it ceased." I have above called Cyprian the disciple of Tertullian, because we learn from St. Jerome that Cyprian when asking for the works of Tertullian always said, "Da Magistrum," "Give me the master." It seems to me a great pity that, owing to the modern public school system, the confirmation of boys of the upper and middle classes is almost entirely passing from their own home pastors to the masters of public schools, and not always with happy results. This tends to increase the hard mechanical view of confirmation against which I protest.